(UUID is for ubuntubuntu--vg-swap_1). This can't work, as the unencrypted one is faster, so trying to set up the encrypted one fails. - Install 15.04 with LVM (no encryption) and select "encrypt my home dir"
- Verify that "swapon -s" has a swap partition (usually dm-2), and that /dev/mapper/cryptswap1 points to that. It should NOT be the unencrypted /dev/mapper/ubuntu--vg-swap_1!. mei 11 07:32:36 Denny-HP systemd-cryptsetup: Set cipher aes, mode cbc-essiv:sha256, key size 256 bits for device /dev/dm-1. So this looks like an LVM variant of bug 953875, not of bug 1447282; this looks independent of GPT. I just registered to confirm this issue. I just did a clean install of 15.04 and let Ubuntu use the entire drive. LVM was checked and encrypt home folder. I did not select full disk encryption. After setup completed, I was asked for the password of the swap partition, which just an (enter) bypassed. After that, I am prompted for the password every time I install updates (just enter makes it go away again). Do I need to post more info or are these details enough to reproduce the issue? I too just did a fresh install in the same manner and am noticing this effect. I did a search because it was getting annoying: eg. 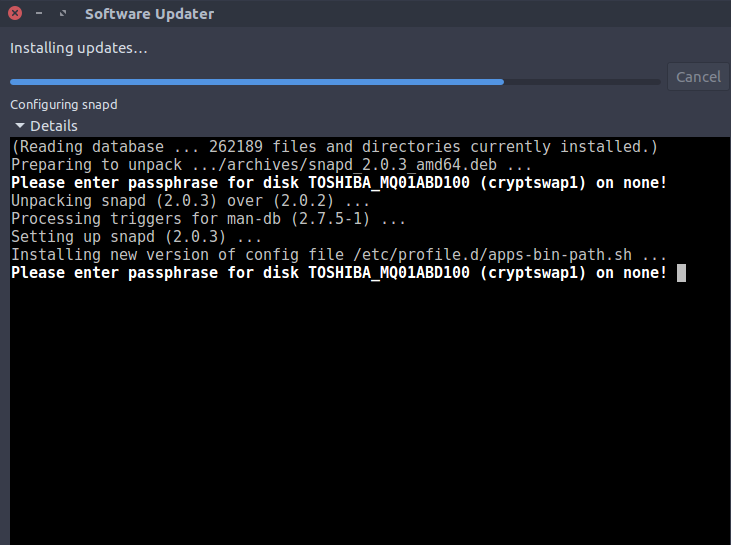 "$ sudo service ufw restart" resulted in "Please enter passphrase for disk ubuntu--vg-swap_1 (cryptswap1) on none! ****************"
It just didn't seem right and I'm glad to find out it is simply a bug. "Please enter passphrase for disk ubuntu--vg-swap_1 (cryptswap1) on none!" => hit enter, the boot continue, and you arrive on login. mai 27 07:44:51 user-VirtualBox systemd-cryptsetup: Volume sda5_crypt already active. mai 27 07:44:51 user-VirtualBox systemd: Started Cryptography Setup for sda5_crypt. mai 27 07:44:51 user-VirtualBox systemd: Found device /dev/mapper/ubuntu--vg-swap_1. mai 27 07:44:51 user-VirtualBox systemd: Found device /dev/disk/by-uuid/f636d7ef-9405-482d-a90a-5ba67026fcfb. mai 27 07:44:51 user-VirtualBox systemd: Activated swap /dev/mapper/ubuntu--vg-swap_1. mai 27 07:44:53 user-VirtualBox systemd-cryptsetup: Set cipher aes, mode xts-plain64, key size 256 bits for device /dev/disk/by-uuid/f636d7ef-9405-482d-a90a-5ba67026fcfb. I've been doing some testing and am finding it isn't LVM related. I'll be doing further filesystem related tests to see what ends up working. May 30 23:35:17 - systemd: Activated swap Swap Partition. May 30 23:35:45 - systemd: Failed to start Cryptography Setup for cryptswap1. May 30 23:35:45 - systemd: Dependency failed for dev-mapper-cryptswap1.device. May 30 23:35:45 - systemd: Dependency failed for /dev/mapper/cryptswap1. May 30 23:35:45 - systemd: Job swap.target/start failed with result 'dependency'. May 30 23:35:45 - systemd: Job dev-mapper-cryptswap1.swap/start failed with result 'dependency'. May 30 23:35:45 - systemd: Job dev-mapper-cryptswap1.device/start failed with result 'dependency'. May 30 23:35:45 - systemd: Unit <email address hidden> entered failed state. May 30 23:35:45 - systemd: <email address hidden> failed. Next I'm going to switch the 1.5TB to MBR instead of GPT and incrementally add options back in. Yuck, that's not working well at all. Seems the installer wants to make the disk GPT. To even change it to MBR, I'd have to "zap" the GPT info and reboot. Without zapping, using fdisk to change it to MSDOS, rebooting, and it would revert back to GPT with all of the partitions. Then after zapping, setting up the partitions, selecting the custom install, GRUB-2 ends up popping up on reboot instead of going into Ubuntu, and I'm not familiar enough with GRUB to set it up from the shell. So, knowing it DID install under MBR, I went back to reinstall and let the installer set it up in it's own way, hoping it would still use MBR... nope, it switched it to GPT. I had looked at Ubuntu on a VM years back and thought it unfriendly, as well as a few other dists, but figured by now it would have been clean. Boy am I mistaken. Mmmm, ya, forget about MBR. Just wasn't going to get it without a good bit of effort I think. Also noticed that I kept having to reboot because LiveCD was using the sda swap partition. Once I swapoff, I wouldn't have to reboot. May 31 03:48:15 ubuntu ubiquity: INFO: Successfully encrypted swap! May 31 03:51:28 ubuntu ubiquity: * cryptswap1 (starting)..
@danny: thanks, so this confirms the issue. Please either drop /etc/crypttab if you want to keep the unencrypted swap, or drop /dev/mapper/ubuntu--vg-swap from /etc/fstab and uncomment #/dev/mapper/cryptswap1. You can't have both. Do you still know how you set that up? In particular, whether you wrote /etc/fstab in that way, or it was set up by some tool? Thanks! This just simply can't work. I can reproduce this with comment 9. So the ecryptfs-setup-swap script fails to disable the original unencrypted swap, and it also needs to add offset= to avoid bug 953875 again. Right now we use unencrypted swap in this scenario, which isn't intended, and get this annoying effect. We need to fix existing stables at least, including trusty. Even though upstart doesn't give you a hint/error about the broken swap configuration, we are still using unencrypted swap there unintentionally. For an SRU we need to extend our horrible ecryptfs postinst hack to detect this situation, apply the "offset=" to crypttab, and comment out the unencrypted swap from /etc/fstab. Given that we have shipped broken swap partitions in pretty much every scenario with ecryptfs (bug 953875, this bug, and to a lesser degree bug 1447282), and static swap partitions are also inflexible and unnecessary on most modern hardware, we should also consider (for wily and later) to entirely stop configuring them, and consider other solutions like "swapspace". Please, please, please disable swap entirely on Ubuntu (wily) or later, and instruct people to 'sudo apt-get install swapspace' if they simply can't live without swap. I confirm symptoms using fresh install of curernt Ubuntu 15.04 desktop amd64 .iso installed using VirtualBox VMDK. When I open a terminal and do "sudo apt-get update && sudo apt-get upgrade", then apt runs as expected, but it prompts for the swap password many times. Installed Ubuntu 15.04 desktop amd64 from standard ISO downloaded about a week ago. Chose to encrypt whole drive and encrypt home directory. When running apt-get upgrade, was getting asked for the crypt drive password over and over. Commented out the /dev/mapper/ubuntu--vg-swap_1 line in /etc/fstab then rebooted. This problem went away. This is fixed on my machine. Thanks for your help! Notes for myself, please ignore. The problem is in the loop that tries to comment out existing swap from /etc/fstab: It only checks for UUID= and the resolved name like /dev/dm-1, but it does not take any symlinks like "/dev/mapper/ubuntu--vg-swap_1 -> ../dm-1" into account. info `gettext "Setting up swap:"` "[$swap]"
warn "Commented out your unencrypted swap from /etc/fstab"
Now we need to clean this up on upgrades. The trick there is to avoid reintroducing bug 953875, from installations which don't have the "offset=" in crypttab. Utopic is EOL in two weeks, let's not bother. This is the debdiff for vivid which I just uploaded. I verified that it repairs /etc/fstab and leads to a correctly booting system with encrypted swap for a vivid LVM+ecryptfs installation. It also behaves sufficiently correctly for an upgrade where the swap partition has been wiped by ubiquity from bug 953875.
crypttab and fstab have a "cryptswap*" device referring to them. Accepted ecryptfs-utils into vivid-proposed. The package will build now and be available at https://launchpad.net/ubuntu/+source/ecryptfs-utils/107-0ubuntu1.2 in a few hours, and then in the -proposed repository. How does one test this when it happens during installation? Does the 15.04 installer ISO get updated? Can we specify the Live Installer flash drive to apply the package via "dpkg" or "apt-get"? For the SRU the step that should be tested most is upgrading an existing broken install. That should fix up /etc/fstab. I'm not sure how to teach the installers "install updates" option to also install from -proposed. Need to get 0 B/105 kB of archives. After this operation, 4 096 B of additional disk space will be used. The verification of the Stable Release Update for ecryptfs-utils has completed successfully and the package has now been released to -updates. Subsequently, the Ubuntu Stable Release Updates Team is being unsubscribed and will not receive messages about this bug report. In the event that you encounter a regression using the package from -updates please report a new bug using ubuntu-bug and tag the bug report regression-update so we can easily find any regressions. Still broken on 15.04 GPT + encrypted home directory install. Will this be fixed for 14.04? Yea, when will be on 14.04? This bug is showing up again in 16.04. @Alexander: Please file a new bug report for 16.04, including your /etc/fstab, /etc/crypttab, and the output of "sudo blkid". # uncomment below per askubuntu 616663? /dev/sda1: LABEL="SYSTEM_DRV" UUID="DE4E-245D" TYPE="vfat" PARTLABEL="EFI system partition" PARTUUID="fa3ebedc-6a3c-4c28-8f53-4a9588ff9cf2"
/dev/sda2: PARTLABEL="Microsoft reserved partition" PARTUUID="090c64a5-4e69-4b14-9bd5-f33d20f7e39c"
/dev/sda3: LABEL="Windows" UUID="CCD45187D4517524" TYPE="ntfs" PARTLABEL="Basic data partition" PARTUUID="fba026e5-cd85-4c4b-b491-20911a75b3a4"
/dev/sda4: LABEL="LENOVO" UUID="225C0D1F5C0CEEFB" TYPE="ntfs" PARTLABEL="Basic data partition" PARTUUID="f37cbed8-7a33-46e7-a166-389751ebc245"
/dev/sda5: LABEL="WINRE_DRV" UUID="988E5EF48E5ECB00" TYPE="ntfs" PARTLABEL="Basic data partition" PARTUUID="ffdb1a41-6b21-424e-82ab-28c6e3acfe30"
/dev/sda6: LABEL="LENOVO_PART" UUID="22E662F4E662C79D" TYPE="ntfs" PARTLABEL="Basic data partition" PARTUUID="abbe5d86-8929-43ea-81bc-0e020e9bbc44"
/dev/sda7: LABEL="LRS_ESP" UUID="1065-1475" TYPE="vfat" PARTLABEL="Basic data partition" PARTUUID="51b5372f-5c24-4367-810f-2e36848b50eb"
I commented that line but I do not understand how to fix the issue and have a properly set-up encrypted swap. I fixed/workarounded this by removing the cryptswap line from /etc/crypttab and instead adding swap to /etc/fstab (non-encrypted). Then I rebooted and the password prompt didn't come up anymore. This only started to come after I had some booting problems because I messed it up so I had to use boot-repair to get it to work somehow and fix the rest myself. This might be considered unsafe, but it works for me and should be suitable for my needs.